Raymond Mason is born in Birmingham, England. In 1937 he enters the Birmingham College of Arts and Crafts with a scholarship. Six years later, he enters the Slade School of Fine Art, London and turns to sculpture. In 1946, he settles in Paris where he studied at the École supérieure des Beaux-Arts, with a scholarship from the French State. He is known for his sculptures of tightly packed people made from clay, with works on McGill College Avenue in Montreal; the Tuileries, Paris; Georgetown, Washington, D.C.; and Madison Avenue, New York. He dies in Paris at the age of 87. Preliminary studies were begun in 1979. 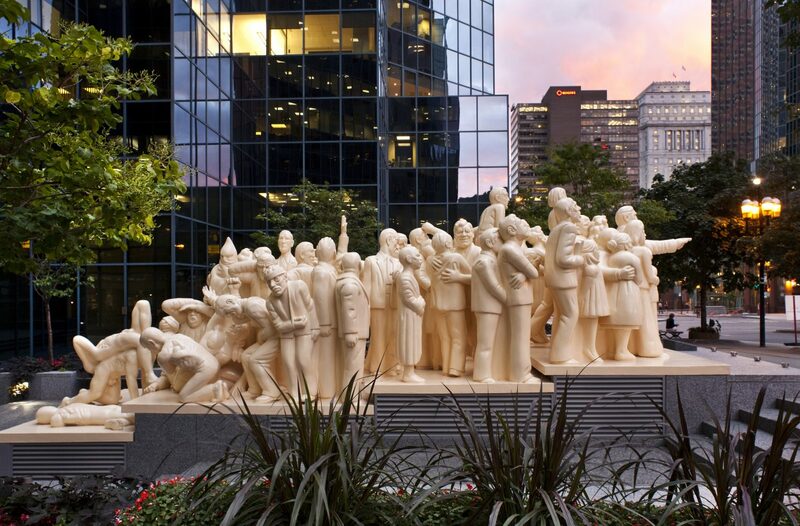 The Louis Dreyfus Property Group contacted Mason in 1980 with the idea of presenting a sculpture by him on the future plaza of 1981, avenue McGill College. He was actively working on The Illuminated Crowd at the time and it was a revised version of the theme which he chose to fit the site. He has always felt that given the strict geometrical forms of North American architecture, the sculpture of the human form is needed. The square paned facades of the building are ideally suited to capture and emphasize the undulation of Mason’s present crowd of 65 figures. Thus, the sculpture is in light ochre in color, singing before the blue of the building. The work, prior to being shipped to Canada, was exhibited in the artist’s retrospective at the Musée national d’art moderne at the Centre Georges Pompidou, Paris, from September to November, 1985. 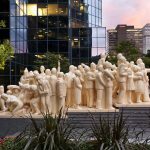 The Illuminated Crowd is the second large crowd sculpted by Raymond Mason. The first, created in 1968, was the climax of all the street scenes which had occupied the artist. Nearly a hundred figures roll down towards the spectator. Indeed, the original drawings were done on Boulevard Saint-Michel, Paris, which is an inclined plane. This earlier work, in bronze, is installed in the Tuileries Gardens in Paris.